The1721 Lady Blunt Stradivarius is named after Lady Byron’s granddaughter who owned the violin in the 19th century. The Lady Blunt is a Stradivarius violin that was made during his golden era. This 1721 Stradivarius violin is a truly rare piece of musical history as it’s in near-perfect, original condition. It’s also considered to be one of the two rarest and most coveted Stradivarius violins in the world. Unlike other Stradivarius violins such as the Milstein, the Lady Blunt has not been regularly played. As such, this Stradivarius has experienced few of the degrading effects of constant playing that some other historical violins have suffered. Without a doubt, the ‘Lady Blunt’ is a well-preserved piece of musical art that retains its full acoustic potential for future generations. The written history of the ‘Lady Blunt’ Stradivarius starts with its sale by the famous Parisian violin maker, Jean Baptiste Vuillaume, who decided to sell the violin to his student, the granddaughter of Lord Byron, Lady Anne Blunt, in 1865. Thirty years later, Lady Blunt decided to sell her beloved Stradivarius violin, which switched hands a few more time before coming to the possession of Baron Johann Knoop. But even Knoop couldn’t hold on to one of the rarest Strads in the world. In 1900, he parted with the violin, which was eventually sold to Mr. J.E. Street. Street then parted with the violin in 1915 by selling it to one of the most important violin collector of the time, Richard Bennett. In 1941, the Lady Blunt was sold to the Swiss dealer and violin collector, Henry Werro, who held on to the Strad until 1959 when he sold it to the noted American collector, Sam Bloomfield of California. Bloomfield then put the Lady Blunt up for auction at Sotheby’s in 1971, which was sold for the record price of $200,000 USD to Singaporean millionaire, Robin Loh. Loh then sold his rare Strad to a private collector in 2000. In 2008, the private collector then sold the Lady Blunt to Japan’s Nippon Foundation who then decided to auction the violin again in 2011. 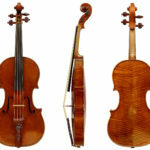 One of the rarest Strads in the world went for a record 15.9 million. All proceeds went to benefit the victims of that year’s Japanese tsunami and earthquake. The Lady Blunt is one of the two best-preserved Stradivarius violins in existence. Thanks to a long history of being possessed by collectors, it has seen little play time despite being over 300 years old. In fact, one of the rare performances by the ‘Lady Blunt’ happened in 1971 by Yehudi Menuhin during the Sotheby’s auction. Without a doubt this was a rare opportunity to hear this rare historical instrument sing.